Aiseesoft Total Media Converter for Mac 6.3.50 無料ダウンロード - Rip any DVD and convert popular video/audio files to any video and audio format. 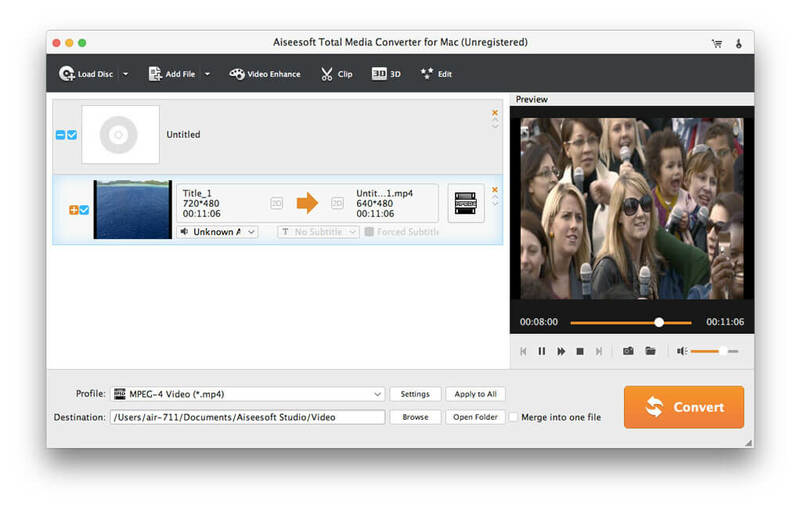 Aiseesoft Total Media Converter for Mac combines the function of DVD converter and Video Converter for Mac. With it, you can rip all kinds of DVD discs and convert popular video/audio files to any video(AMV, ASF, DivX, Flash H264, FLV, SWF, H.264 AVI, H.264/MPEG-4 AVC, M4V MPEG-4, MKV, MOV, AVI, MPEG-1, MPEG-2, MPEG-4, MTV, VOB, WMV, XviD, DV, DVD, VCD, WebM, HD) or audio(AAC, AC3, AIFF, AMR, FLAC, M4A, MKA, MP2, MP3, OGG, AU, WAV, WMA) format. Moreover, it can also support iPhone 5 and iOS 6. This Total Media Converter for Mac is capable of converting DVD to any video/audio format, like AVI, MPEG, WMV, MP4, RM, MOV, 3GP, VOB, FLV, MP3, WMA, etc and HD video.